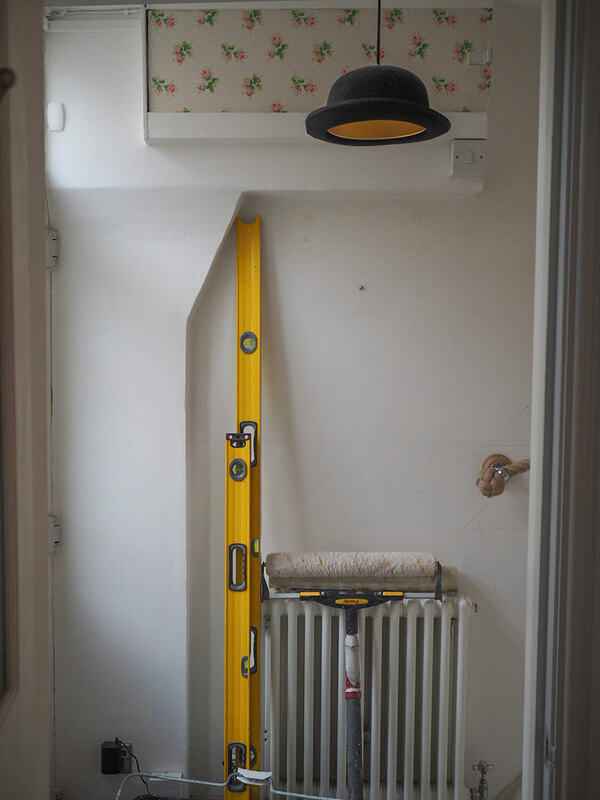 I’m beyond excited to share today’s blog post with you: my hallway makeover! Making this house a home has been the best decision I’ve ever made (apart from buying it of course). This is my first home, and I came here knowing that it wouldn’t be my forever one. Buying a house is an expensive business; but it was really important to me that I invested in decorating as soon as I could. I was determined not to spend the few years I’d be living here, feeling like I was living in someone else’s space. 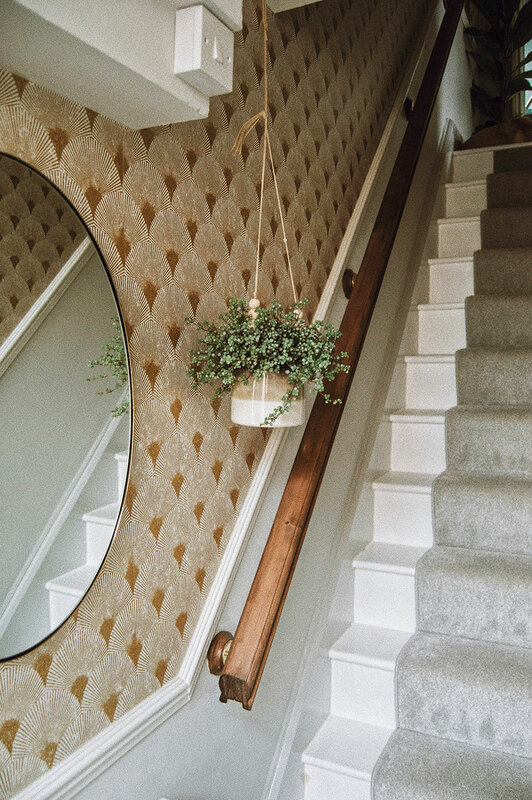 From the wallpapered stairs, to the bizarre rope handrail and top hat pendants, there wasn’t an inch of it I wanted to keep. I spent hours upon end searching Pinterest for ideas for this space. And from that, I decided on a few key design choices. 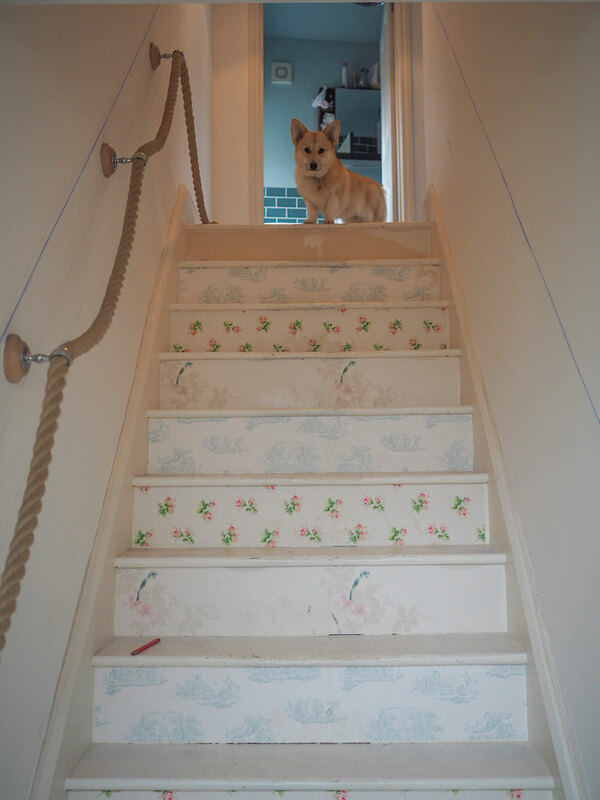 I was ripping off that ghastly wallpaper on the stairs if it was the last thing I did. And let me tell you, it was nearly the death of me. It took me an entire day to scrape it off. (PSA: wallpapering wood is the worst idea in the world). But my god was it worth it. I bought some white floor paint from B&Q so that I could have a neutral base for the runner to sit on. Initially I wasn’t sure on what colour carpet to go for. 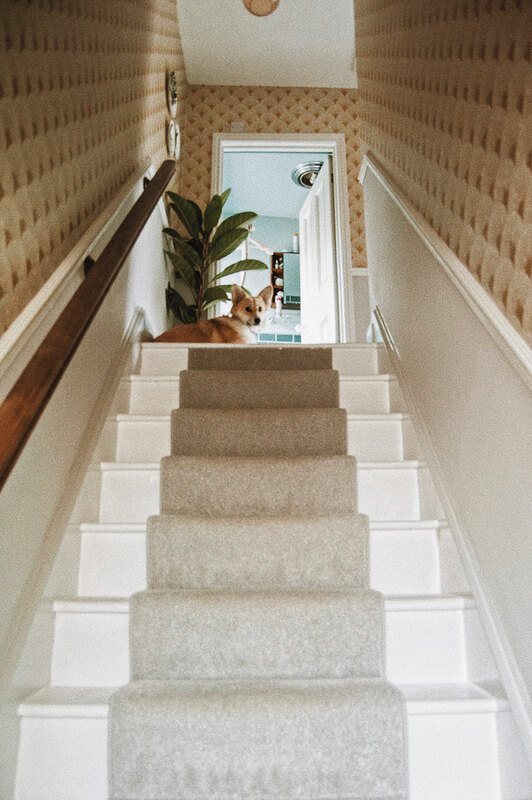 My first thoughts were plain walls and something super bold for the stairs, but I quickly changed my mind when I found the wallpaper. Grey felt like a good, comfortable option. I went for a light shade so it didn’t darken the space and decided against brass poles as I thought it’d be a little over kill. Seemingly a forgettable aspect, but I was dead-cert on what I wanted. Something robust and sturdy was a must. 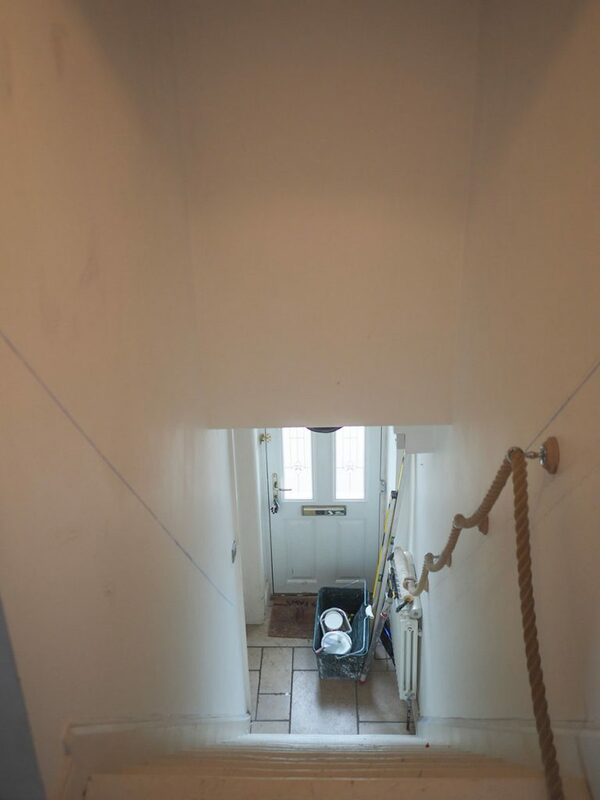 The chaps who installed the wallpaper for me, picked this up from Wickes and used the existing fixings from the awful rope to fix it to the wall. Jamie stained it for me with a walnut varnish and I love it. (side note: would 200% recommend staining before you put it up on the wall. There was a lot of gasps going on as jg painted this!!) Varnishing/staining yourself is something I would definitely recommend, it keeps the costs way down and looks just as good. Ahh, my one true love in paper form. As soon as I spotted this on the Graham and Brown website I knew it had to be mine. The Art Deco vibe and glittery gold highlights are the things my dreams are made of. It’s an insanely great quality and has honestly made me feel so proud to open the front door to whoever comes knocking! I was a little worried that it might be a bit much on the eyes, but I think I’ve balanced it out well enough. Pretty old fashioned, right? Well let’s just say I’m a woman of tradition (I’m really not). But I do blooming love a dado rail. When the wallpaper was decided, I knew straight away it would need some separation. I made the choice to have the rail installed a third of the way down the wall. I wanted the wallpaper to be the main feature, and the paint to just frame the space. Being quite a small, dark space mirrors were essential. The first is in the entrance to the house and is from Oliver Bonas. I don’t know about you, but I like to do a quick once-over on myself before I leave the house. And for practical, less vain reasons, it also works really at opening what is otherwise a very small space. 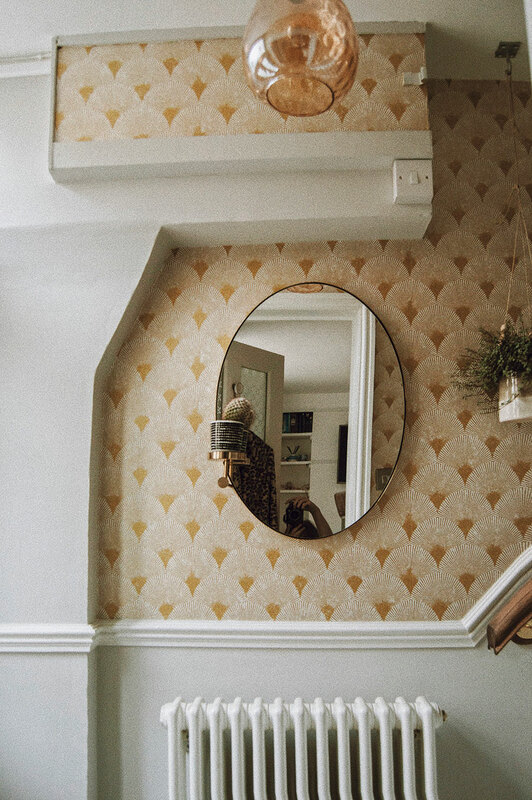 For the mirror on the stairs I knew I wanted something statement. I didn’t think there was much use in having a large mirror that I wouldn’t really be able to use, so I went for this from Exclusive Mirrors. A bunch of beautiful little mirrors all in one! It’s super affordable, lightweight and looks really bloody great if you ask me. To break up the pretty consistent gold theme, I opted for some greenery. I adore this hanging planter from Att Pynta and thought it was great for this small space. I pick up most of my plants from local garden centres, but would also highly recommend IKEA for super affordable, great quality greens (of the plant variety). The plates are from White Hart Studio in Haddenham, which is a beautiful little store that sells incredible homeware. They’re from a designer called Chase and Wonder, who create pieces that remind me of Fornasetti but at a fraction of the price. The mat and wicker planter on the landing are both from Homesense. Which has also been a must for me when picking out bargains for the house. Last up is the pendants – and again at an absolute steal for £25 each. They’re made of sturdy, thick glass and give such a gorgeous ambience when they’re on. And I think that’s all! I really hope you’re enjoying seeing these snippets into my home. It’s so lovely sharing the process with you – I can’t wait for the next one. 6 THINGS I’VE LEARNED LIVING ALONE. I am renovating my house too so I can only love this post. 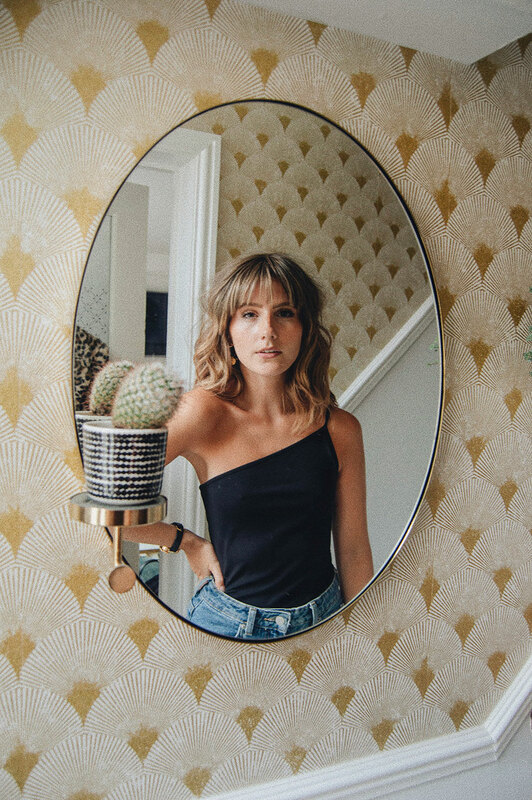 I am loving your wall paper , mirror and plant hanger. Anyway… overall ts beautiful. 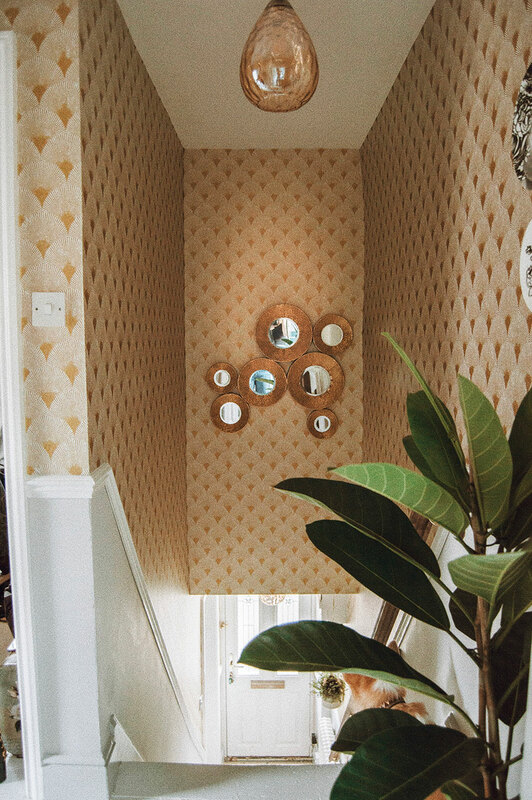 what a gorgeous hallway! 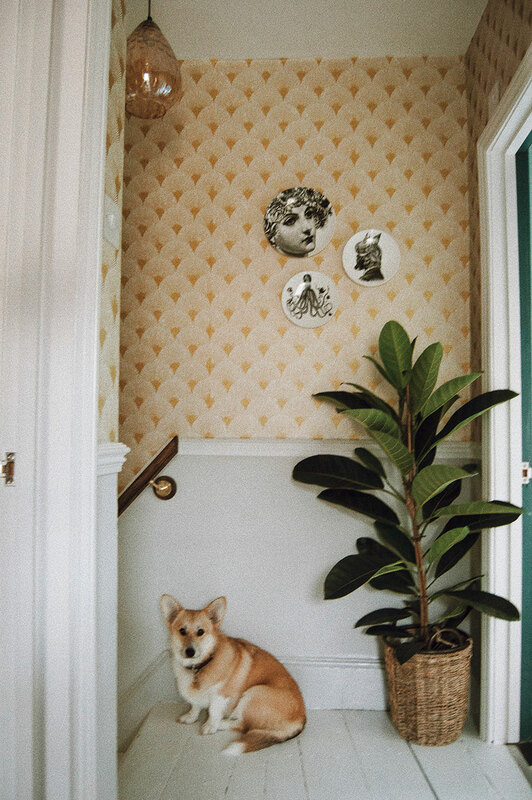 love the bold wallpaper… and of course, plants and greenery!